Moliere Reading to His Servant "La Foret"
"The great French dramatist was one of those great men who are not altogether heroes to their valets, and his biographers are forced to admit that in his domestic affairs he was frequently very small. No servants could please him, the slightest inattention or neglect provoked a storm, 'a window open or closed one minute before or after the moment he had ordered threw him into convulsions.' 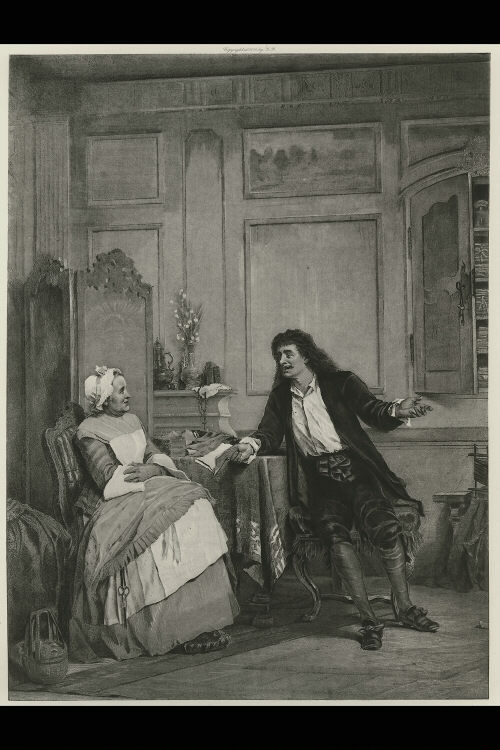 His faithful old servant, La Foret, suffered as much as any of the others from these irregularities, notwithstanding the use he is said to have made of her as an auditor for the reading of the first drafts of his works. One of the preliminary trials is here depicted by a German painter settled in London, and if we may judge by the expression of the good woman's countenance the new drama should be one of those that will win the favor of the people, if not of the Court."